other matters considered necessary for development. The MGA provides the basis for statutory and non-statutory plans. An Intermunicipal Development Plan (IDP), a Municipal Development Plan (MDP) and an Area Structure Plan (ASP) are all statutory plans under the MGA. These plans provide planning direction at a higher level and increase in detail progressively through the planning hierarchy to guide growth and development. Why is the WOASP being completed? The Town has identified the need for additional land to accommodate future population growth to 80,000. 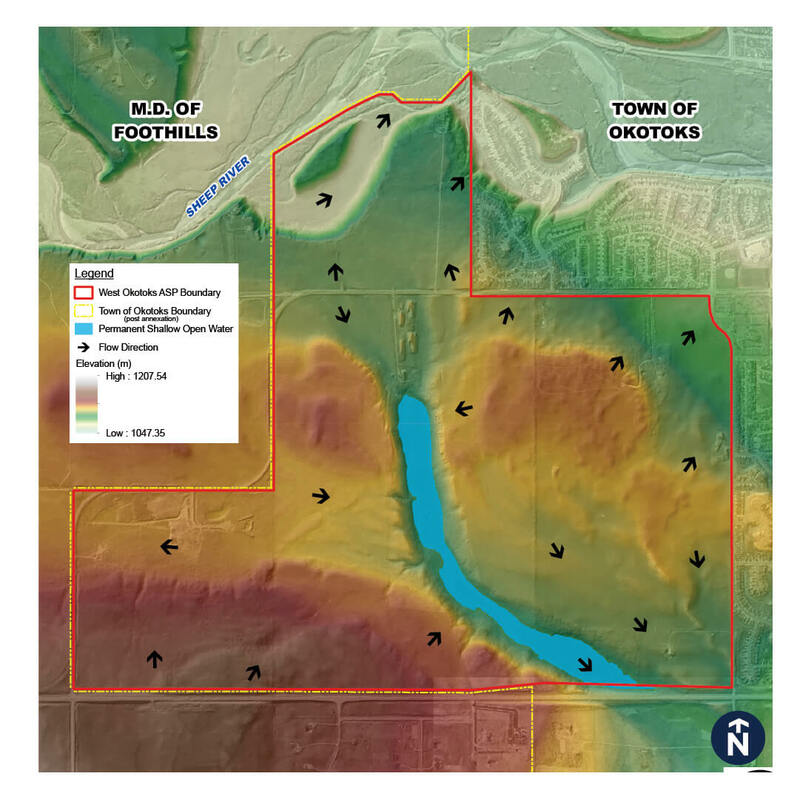 This identified need, coupled with the Town’s growth mandate, led to the recent annexation of 1,950 hectares (4,900 acres) of land from the Municipal District of Foothills effective July 1, 2017. 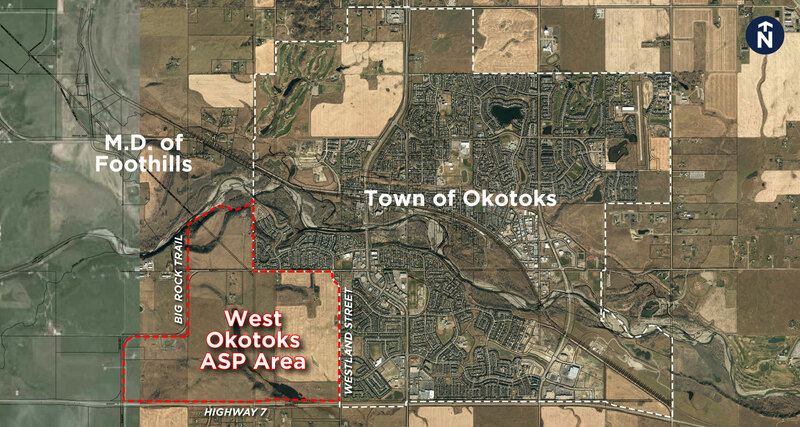 The West Okotoks Area Structure Plan area was included as part of this annexation. Due to previous M.D. 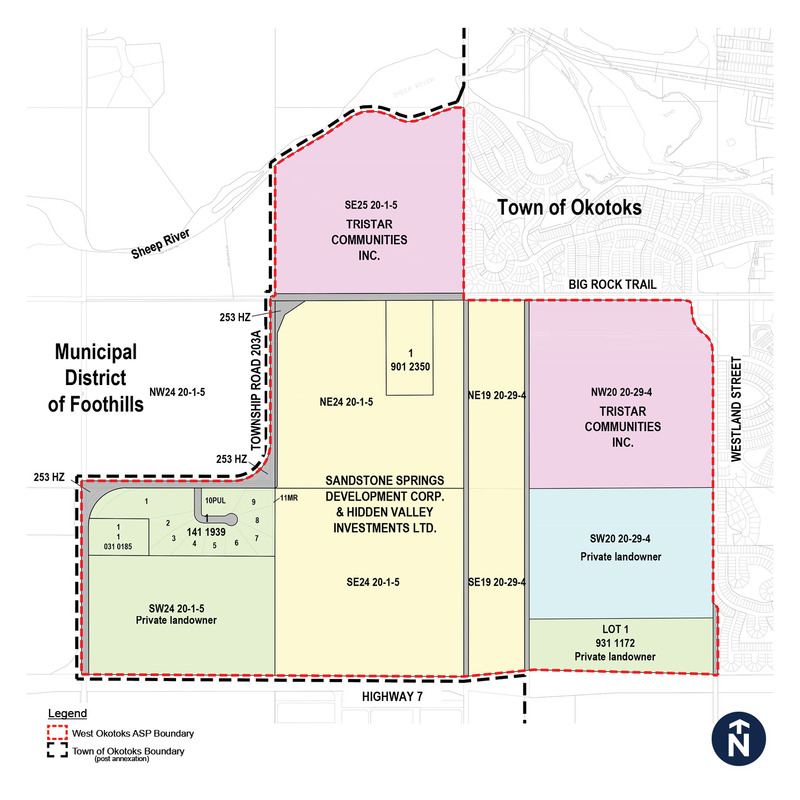 of Foothills planning approvals on portions of the WOASP area, coupled with the need to initiate long-term planning for the area, the Town has agreed to proceed with the area structure planning for the West Okotoks plan area. Although the WOASP is being completed prior to a new Town Municipal Development Plan or Growth Strategy, the ASP will ensure alignment with these new plans by working closely with the Town and by including special policy provisions that ensure alignment over the long term. Who is leading the WOASP planning process? The West Okotoks ASP is a developer funded process directed by the Town of Okotoks. Who are the WOASP project sponsors? The WOASP plan area is situated within the southwest portion of the Town of Okotoks. The plan area occupies a strategic gateway into the Town given its adjacency to Highway 7. The plan area is bound by Highway 7 to the south, Westland Street to the east, the Sheep River to the north and Big Rock trail to the west. Various interface conditions exist which will need to be considered as part of ASP land use planning and policy development. The West Okotoks ASP area spans just over a thousand acres and is located within lands annexed from the Municipal District of Foothills No. 31 to the Town of Okotoks, effective on July 1st 2017. The Town, in conjunction with the M.D. 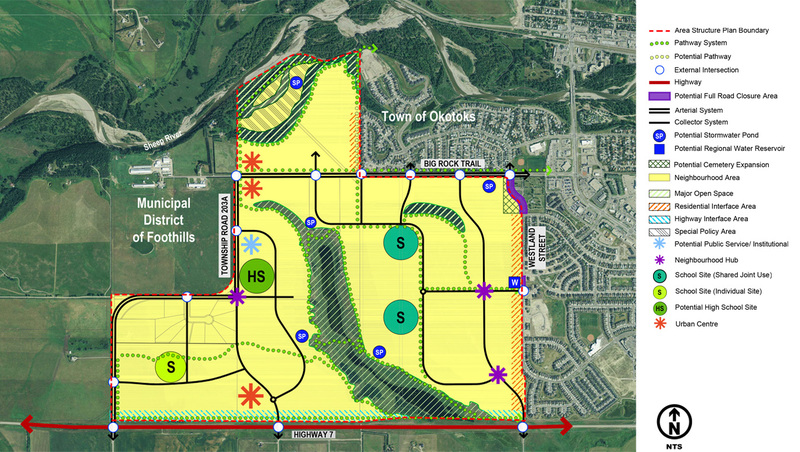 of Foothills, had authorized the initiation of a developer-funded ASP in anticipation of the annexation of the lands into the Town of Okotoks. The development and review of the West Okotoks Area Structure Plan is now proceeding through the Town planning and review process. The results of these assessments have helped improve our understanding of the land and informed the preparation of preliminary land use and transportation concepts for the plan area. The DRAFT WOASP land use concept is outlined below and remains subject to refinement stemming from comments and feedback received through the resident engagement process, external circulation and Town review processes. A preliminary land use hierarchy has been established for the plan area and is detailed below. As the ASP document is formed, a comprehensive policy framework which relates to the plan elements will be developed. Neighbourhood Area – will contain a diversity of residential housing types, neighbourhood parks, and local roads that will provide housing opportunities and amenities for a variety of Okotoks residents. Community Node – comprehensively planned, mixed-use activity centres that serve the needs of the surrounding community (uses may include commercial, high density residential, and other compatible uses). Neighbourhood Hub– a focal point of a neighbourhood that may contain a combination of local commercial uses, medium-high density residential uses, and amenity space. School Site (Shared Joint Use) – potential site for a shared school site containing two school buildings and associated play fields. School Site (Individual Site) – potential site one school building and associated play fields. Potential High School Site – potential site for a high school building and associated play fields. Major Open Space – areas that are as open space due to their environmental features. Regional Pathway – a pathway system that connects residents to key amenities within and adjacent to the community. 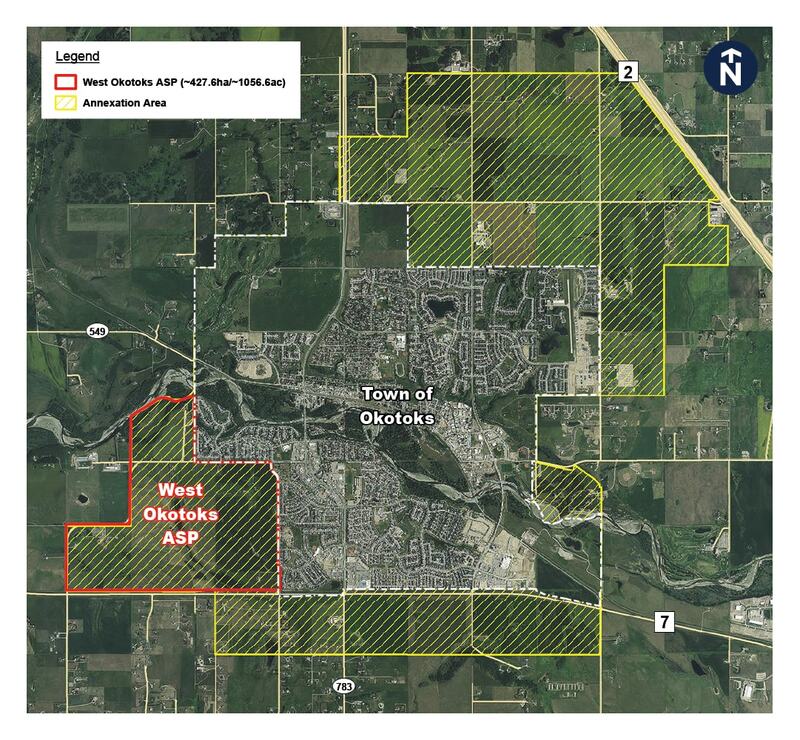 Potential Cemetery Expansion – potential expansion of the existing Okotoks Cemetery and potential road closure of a portion of Westland Street. Residential Interface Area – portions of the plan area that are adjacent to existing homes. Policy wording in the ASP will speak to the appropriate interface conditions with existing residential uses. Highway Interface Area – portions of the plan area that are directly adjacent to Highway 7. Policy wording in the ASP will acknowledge compatible interface conditions with the highway. Potential Public Service / Institutional– a site for potential future public services or institutional uses identified by the Town of Okotoks. A DRAFT land use hierarchy which relates to the DRAFT land use concepts has been established for the plan area. This land use hierarchy forms the basis of the DRAFT policy structure and directions contained in the DRAFT WOASP.